The Sky's The Limit at Purdue! Purdue Mechanical Engineers are doing amazing things around the world -- and even above the world! Watch the videos below, and learn why it's a great time to be a Mechanical Engineer, and Purdue is the place to make it happen! What Can You Do With an ME Degree? Engineers aren’t all about theory -- we also like to build race cars and robots! Scott Tingle got his MSME from Purdue in 1988, knowing that NASA loves Boilermakers. Now he's fulfilled his dream of launching into space! Read the extended article about Scott, and watch the video of how he went from motorcycles to fighter jets to the International Space Station! 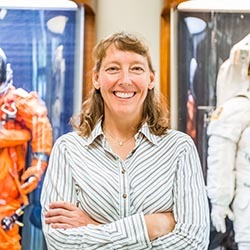 "Purdue is one of the best decisions I've ever made"
Amy Ross followed her father's footsteps into Purdue ME, as well as NASA. But while Jerry Ross was destined to become a spacewalker, Amy wanted to build the spacesuits that would protect our astronauts. Her work was put to the test in 1998, as her Phase VI gloves were first tested in space... by her father Jerry. Those Phase VI gloves are still in use today by astronauts aboard the International Space Station. Read Amy's full story, and watch the video. 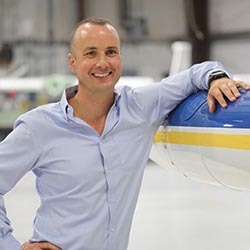 When Ben Diachun (BSME '99) attended Purdue ME to learn problem-solving, he never imagined his first challenge would be working on the world’s first privately-funded spacecraft, SpaceShipOne (which now hangs in the Smithsonian). Ben is now president of the company that built it, Scaled Composites. His next challenge? The world’s largest airplane, the 385-foot wingspan Stratolaunch, designed to deliver payloads to multiple orbits and inclinations in a single mission. "We're still exploring what is possible in aerospace," says Ben. "We're going to keep going." Read his full profile in the LA Times. As a biomedical engineer at Lockheed Martin, Mark Baldwin (BSME '97) is helping to test NASA's next deep-space crew capsule, Orion, for all contingencies of human comfort and safety. For example, during the vibration of liftoff, can astronauts easily read and operate the controls? And during splashdown re-entry, when some of the greatest G-forces occur, how will astronauts be protected? Mark's real-world torture tests on the ground will lead to safer spaceflight in the stars. Moira Gunn has Purdue degrees in Computer Science and Mechanical Engineering. So how did she became a radio host? 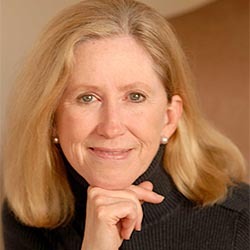 As it turns out, math has served Moira well in all of her careers -- from working at NASA, to engineering robots for IBM, to interviewing the most prominent scientific minds on the NPR program Tech Nation. Read the full profile and watch the video. In his early life, Baratunde Cola (Ph.D. '08) combined his love of football with his love of science and engineering. 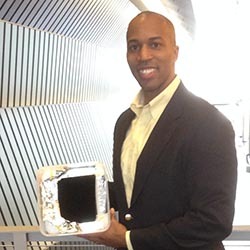 He succeeded at both, becoming the starting fullback at Vanderbilt, and also the first graduate student to work at Purdue's Birck Nanotechnology Center (the largest academic cleanroom in the world). Now a professor at Georgia Tech, he has harnessed his expertise of nanotechnology into a startup business: Carbice, which builds heat-dissipating materials out of carbon nanotubes for the space and semiconductor industries. Watch his video. Talk about a dream job for gearheads! Ken Morris (BSME ‘89) joined General Motors and eventually became the Lead Development Engineer for the original Cadillac CTS. During this time, he pioneered GM North America’s usage of Germany’s famed Nürburgring racetrack for vehicle development. Morris has driven more than 1,800 laps on the Nürburgring, while leading the dynamic development of GM’s vehicles. Read this profile in Automotive News. Lumbar punctures can be difficult and painful -- but a Purdue ME alum wants to change that. Jessica Traver is the CEO of IntuiTap Medical, a startup company launching a device that uses electronic sensors and digital readouts to help guide the procedure. Jessica's work with the IntuiTap put her on Forbes Magazine's 30 Under 30 list of healthcare innovators in 2017. Read the full profile and watch the video. 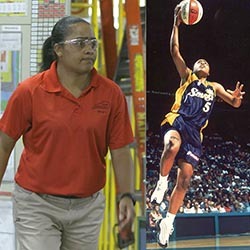 Ukari Figgs (BSME '99) is a legend at Purdue, as the MVP of the 1999 National Champion Women's Basketball team. But she's just as proud of her work as a Mechanical Engineer, which she showcases every day at Toyota Motor Manufacturing in Georgetown, Kentucky. Read the full profile and watch the video. 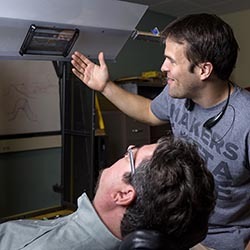 RoboTable, developed by Purdue ME grad Jeff Ackerman and Prehensile Technologies LLC, will assist veterans and others with disabilities, thanks to a grant from the U.S. Department of Veterans Affairs. "We want veterans to feel more productive, more entertained and happier while in bed for long periods," says Ackerman. "The more independence we can give to a person with a mobility impairment, the more their quality of life can improve." Every year, Purdue hosts the Collegiate Drone Racing Championship. Each race is an exhilarating 2 minutes, as the small quadcopters fly at nearly 80 miles per hour. Pilots maneuver the drones while wearing goggles, receiving live wireless video from the drone's point of view -- so both pilots and spectators alike can feel like they are in the cockpit of the drone, dodging the obstacles of the course. Watch the video feature on drone racing at Purdue. 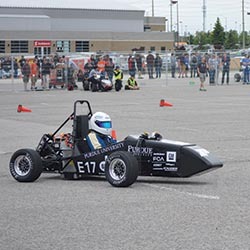 Every year, dozens of Purdue ME students embark on a year-long journey to design a race car from scratch, build it, test it, and then race it against other universities at events sponsored by SAE (Society of Automotive Engineers). There are teams for Baja off-roaders, mini Formula-style racers, and even electric cars. Not only do team members manufacture the car; they are also judged by their business plans, their design and budgeting skills, and their teamwork. Purdue Baja: Design a Car, Build It, Race It! The student engineers of Purdue Hyperloop are dedicated to designing and building a prototype for Hyperloop, a newly-proposed transportation system where pods travel in a near-vacuum tube, potentially reaching speeds of more than 700 miles an hour. SpaceX hosts competitions on their mile-long test track in Hawthorne, California. Read the full story and watch the video. Building complicated machines to accomplish a simple task is a Purdue tradition, dating back to the 1950s. 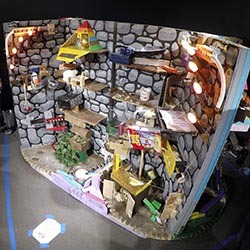 Other schools joined in the fun, and today thousands of students around the world take part in the Rube Goldberg® Machine Contest. It’s the perfect way to integrate everything you learn in engineering, while also showcasing your sense of humor in storytelling! It’s no surprise that Purdue ME teams are frequent champions. Watch the 2018 champion machine pour a bowl of cereal! Watch the 2017 champion machine apply a Band-Aid! From Rube Goldberg® to SpongeBob: The Musical! At Purdue FIRST®, college students build and mentor FIRST® Robotics teams, from kindergarten to 12th grade. The students volunteer their time, from developing ideas to building to competing with other teams at elaborate FIRST® events. Watch the organized chaos of a FIRST® event! Purdue Engineers are called upon for all sorts of unique projects. 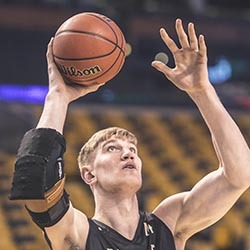 But when men's basketball star Isaac Haas urgently needed a brace for his arm, Purdue ME professor Eric Nauman was ready. He and his team designed, prototyped, constructed, and fit-tested a custom brace for the 7' 2" center, all in just 30 hours. 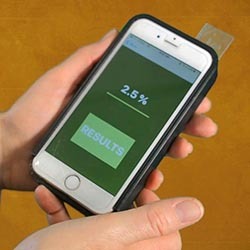 A Purdue team has developed a smartphone-based pathology lab that can detect cholera in 30 minutes, instead of 3 days. PathVis combines the fluid dynamics of Mechanical Engineering and the pathogen detection of Biomedical Engineering. Partha Mukherjee and his team have just published research that examines the relationship between the active and inactive elements of lithium-ion batteries, and how the micro- and nano-structure of their respective ingredients reflects on the performance and safety of the batteries. The study was recently featured on the front cover of the journal ACS Applied Materials & Interfaces. Jeff Rhoads' team have developed a method to deposit tiny amounts of energetic materials (explosives, propellants, and pyrotechnics) using the same technology as an inkjet printer. 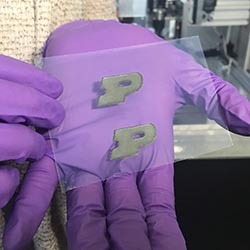 This research, which combines Purdue expertise in both energetic materials and additive manufacturing, allows energetic materials to be deposited with unprecedented levels of precision and safety. 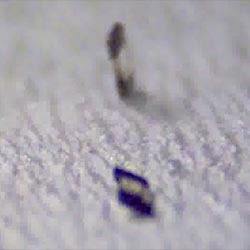 David Cappelleri and his team develop micro-robots, smaller than a millimeter. Their latest creations are All Terrain Microbots, which can "tumble" over obstacles in both dry and wet environments, using a rotating magnetic field. They envision biomedical micro-robots being injected into patients for super-focused drug delivery. 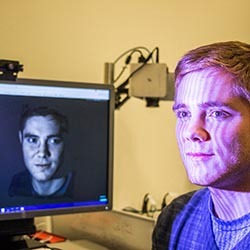 Song Zhang's lab has developed Holostream, a platform that allows live 3D images to be captured, compressed, streamed, and displayed over standard consumer cellphone networks. 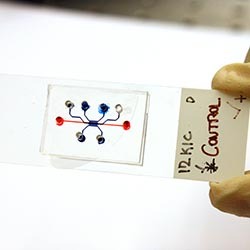 This tumor-microenvironment on a chip can test cancer treatments even more accurately than testing on animal subjects. It was developed in the lab of Purdue ME professor Bumsoo Han. This earwig's wing is an origami marvel of the animal kingdom. 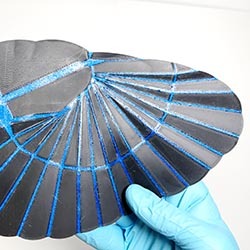 In research published in the journal Science, Andres Arrieta shows how Purdue Engineering studied and re-created this bio-inspired origami for human use. Neera Jain and Tahira Reid have developed a new classification model to measure how well humans trust machines, based on brain-wave patterns and galvanic skin response. It is the first time EEG measurements have been used to gauge trust in real time. 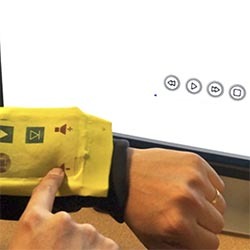 A new type of tactile sensor can be easily embedded into fabrics, potentially enabling anything in the real world to become an interactive device. Developed by Karthik Ramani, iSoft uses multimodal sensing on piezoresistive elastomer, which can then be customized by the user to form any shape or function. Heat produces sound waves in fluids -- but Carlo Scalo and Fabio Semperlotti have discovered that these sound waves also occur in solids. 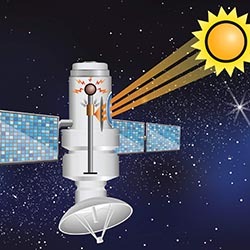 This could lead to new thermoacoustic engines, and even power future spacecraft and satellites. 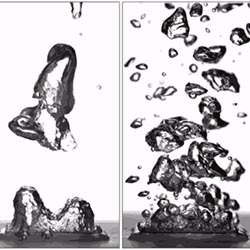 Purdue ME researchers have learned how to boil water off superhydrophobic surfaces, leading to new device-cooling potential. It's featured on the cover of the journal Physical Review Letters. Founded in 1958, Purdue’s Herrick Labs is the premier academic research center for refrigeration and air-conditioning. All aspects of human-building interactions can be precisely monitored, from energy usage to human comfort. It’s no surprise that dozens of industry partners collaborate with Herrick on world-changing research. Cummins at Herrick for industry "speed dating"
Set on 24 acres next to Purdue Airport, Zucrow Labs is the largest academic propulsion lab in the world, specializing in high-pressure combustion and gas turbines. More than 150 Purdue students do research there, many moving on to NASA, SpaceX, and Blue Origin. The Maha Fluid Power Research Center enables researchers to model the behavior of hydraulic pumps and motors, and then gives them 15,000 square feet to test on real-world power equipment. At Birck Nanotechnology Center, students and faculty can manufacture and test nano-sized materials in a huge environment. The 186,000 sq. ft. facility includes an ISO Class 3-4-5 nanofabrication cleanroom, and an ISO Class 6 pharmaceutical-grade biomolecular cleanroom.